Right so i forgot to poaopk on Saturday (I know - really stupid). 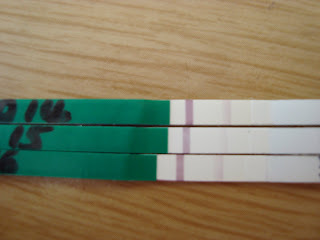 Sunday's opk was very clear, but not as dark as the control line. Monday's was darker than Sundays, but Tuesday's was the same as Monday's!!! Confused?? Imagine my mind! One thing that was quite hectic though is the pain I had yesterday. I felt like I could barely walk. Now people in the know say it could have been the egg being released? So I guess we will wait and see! Either way, i presume i am in the two week wait now - time will tell!